People who know me know I hate Hanukkah. Among other things, it’s the least important holiday on the Jewish calendar. It commemorates a war — the war that marked the first recorded use of guerrilla warfare in history — rather than something religious. The story of the oil lasting eight days was entirely made up and didn’t come into existence until a couple of hundred years after the holiday was created. And we can’t even decide how to spell the damn holiday. Does it start with an h or a ch? Shouldn’t it actually begin with a “kh?” Does it have one or two n’s? One or two k’s? Does it end with an a or an h? 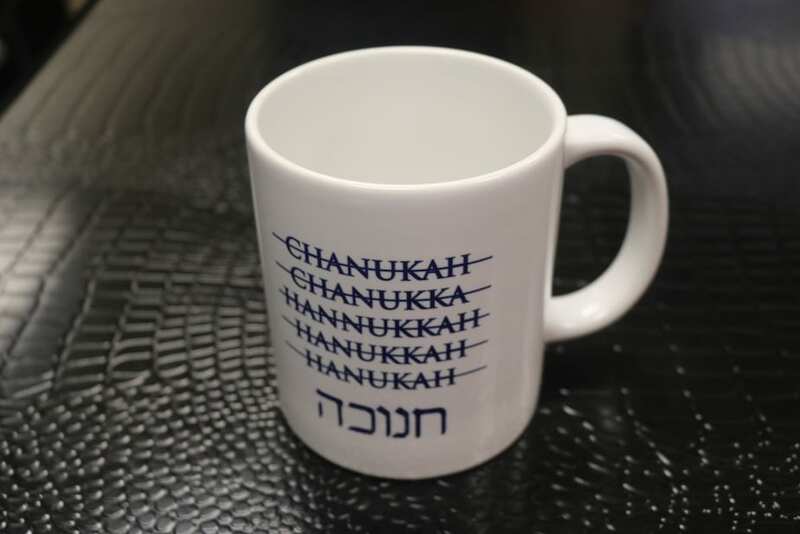 If you transliterate the Hebrew spelling (as seen on the mug above) it should be spelled Khanookah, the only way absolutely nobody spells it. My first reaction to the war on Christmas accusation was to explain my vague holiday wish. After all, there are multiple holidays at the end of the year — Christmas, New Years, Hanukkah, Kwanza, Festivus — and I really don’t know your religious affiliation or what you celebrate, but whatever it is, enjoy your traditions. But that assumes I’m talking to intelligent people and, damnit, people want to be wished Merry Christmas. So my next reaction was to retract my holiday wish and replace it with a offer of death and destruction instead. But Fox-News-War-On-Christmas aficionados just take that as proof of their own religious oppression and I hate to feed a persecution complex. So here’s my latest answer to anyone who objects to my perfectly innocent and inclusive “happy holiday” wish. “Chanukah commemorates when the Assyrians tried to stop the Jews from practicing their own religion. A few thousand of us rose up and beat the holy crap out of an army of 40,000. And just to piss the Assyrians off even more, when it was all done, we not only continued observing our old holidays, we totally made up this ridiculous additional holiday and made it last eight nights because we pretend the oil that was left in the temple lasted eight nights. And, by the way, if I know you’re Christian, especially if you’re observant — and by that I mean Christmas means more to you than just how much stuff you’ll get — I usually do say, “Merry Christmas.” But if I just happen to wish you happy holidays, New Years is coming a week after Christmas and I might just like you enough to hope that holiday is good for you too. No offense meant. I’m really not trying to oppress you. Outstanding! This is among your best, David. Thanks for putting a big smile on my face. I shared it on my Facebook page with a shoutout to you.